Because of a disgusting gelatin salad in the past, I altered the recipe for the Grapefruit and Carrot Salad. I omitted the vinegar and salt, and the salad turned out quite yummy! The base is lemon gelatin. The grapefruit and carrot together worked better than I thought. The salad disappeared over the next few days, so that was a good sign. It also confirmed that there is no place for vinegar and salt in a gelatin salad. Sorry 1940s! Green beans replaced buttered spinach. Any cooked spinach is a big NO GO for our family. 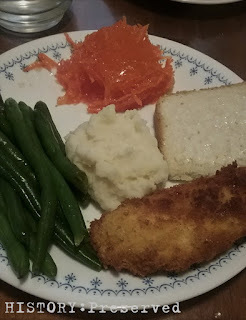 :-) I wasn't in the mood to face all the work of creamed potatoes, so mashed potatoes was a great replacement. The economy ice cream was pretty involved, so I didn't end up making it. I'd like to in the future though. I've found quite a few interesting wartime ice cream recipes. Maybe this summer!